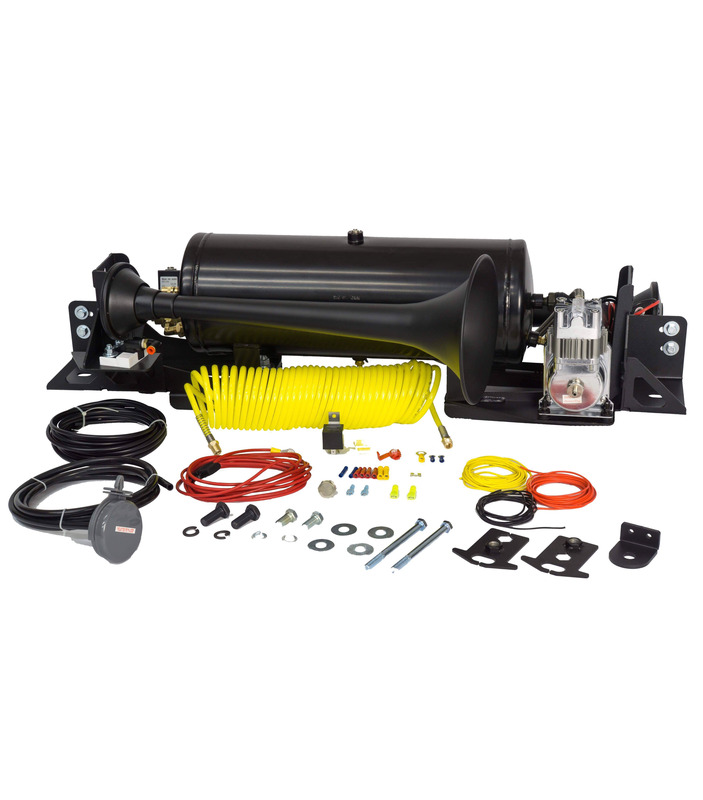 The Onboard Air System and Train Horn is 100% Bolt-On and features a heavy-duty Kleinn waterproof air compressor and 3-gallon air tank mounted on Kleinn Direct-Fit, Made in the USA, mounting brackets. The comes complete with the Demon™ model 730 spun steel triple train horns that produce a thundering 157.8 decibels. Want it louder? Add the Ultra Blaster Valve Upgrade (P/N 6890) to your order. This kit includes two more Vortex 6 all brass solenoid valves, 12 feet of 1/2″ airline and all necessary fittings to mount a Vortex 6 valve on all three trumpets to deliver the maximum air volume and pressure. Using basic hand tools, anyone can install their own onboard air system – all without drilling a single hole! Everything needed comes in one box for a professional & flawless installation. Kleinn Direct-Fit Powder Coated Mounting Brackets – Made in the USA! 3-Gallon Air Tank with Cortec™ Interior Anti-Corrosion Coating – Made in the USA!